It'll be Season 23 next fall for The Simpsons. Fox announced the pickup on Thursday while also noting that the longest-running comedy series in TV history will have 515 episodes under its belt at the end of the 2011-12 season. "Like many 22-year-olds, The Simpsons is extremely happy remaining at home, on Fox, and hopes it doesn't have to go out into the real world for many years to come," co-executive producer Al Jean said in a publicity release. 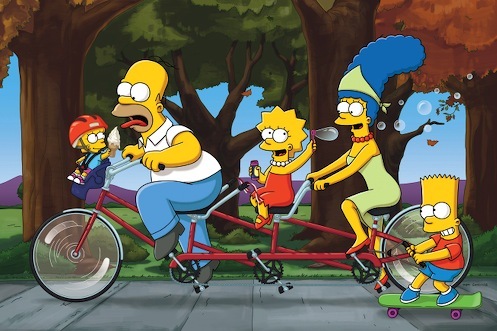 Fox also will offer the "World Broadcast Premiere" of 2007's The Simpsons Movie on Thanksgiving night. ***Fox has hired another CNN expatriate. Lou Dobbs will be getting his own show sometime next year on Fox Business Channel while also contributing regularly to Fox News Channel. He left CNN a year ago after his repeated rallying cries against illegal immigration finally clashed with the network's still steadfast opposition to "advocacy" journalism. Greta Van Susteren, also formerly of CNN, continues to host a long-running prime-time program on Fox News Channel. And Glenn Beck is self-explanatory. The No.1-rated all-news network also has recurringly dipped into the ABC News pond, hiring Brit Hume, Chris Wallace and John Stossel over the years. ***It's going to be curtains for NBC's Undercovers and Fox's Raising Hope. NBC has said it won't be running Undercovers, from Lost/Fringe creator J.J. Abrams, after its initial 13 episodes have played out. And Fox is taking Running Wilde off the air for the remainder of the November "sweeps" ratings period. If it returns, it will only be to burn off any remaining new episodes. ***AMC has renewed The Walking Dead for a second season after its 90-minute Halloween night premiere broke a ratings record for the network with 5.3 million viewers. The ongoing Season 1 of Walking Dead will last for just six episodes, but AMC has ordered a full complement of 13 for Season 2. ***Gene Shalit has left NBC's Today show after 40 years as its movie critic. His last day was Thursday, Nov. 11th.